NoX Edge is a powerful enhancing Hemodilator that has been formulated to speed recovery and boost NitricOxide (NO) levels in the body assisting in increase in muscle size, strength, endurance, power output, load capacity and a perpetually pumped up physique. 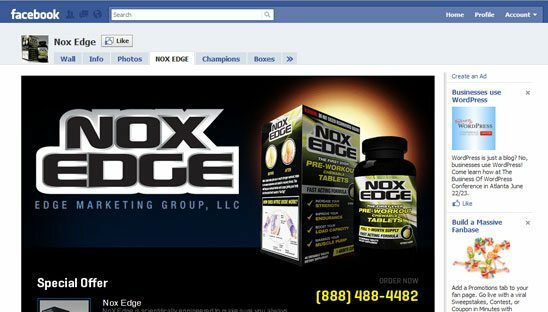 NoX Edge is scientifically engineered to make sure you always get the most out of your workout! Self confidence derives from knowing that you have the right type of skills and interesting goals to achieve. We designed 2 custom facebook fan page tabs. Based off their product and web designs, we were able to come up with a nice design with ways to get people to the website.